Vorgestellt wird “a pair of standard American pattern umbilical scissors”. .
“American Pattern umbilical scissors reduce cord slippage. Sharp, precise blades minimize tissue damage, thus reducing the risk of cord infection. Both brands, Medline Konig and Miltex, feature lifetime guarantee. Obtained from an estate sale in NH of an GP/OB/GYN country physician; Is a tool by DONIGER & Co. GERMANY, which is approx. 4 inches long. When the 1.5 inch long blades are oppossed to the closed position; it still has a 1 inch oval opening within the very sharp blades. It's in very good shape and functional. 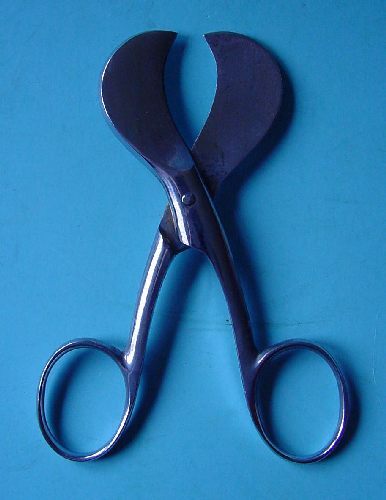 I've been told this implement is umbilicus cord scissors".